As one of 14 students in the United States selected for the scholarship this year, Montee is only the second student from Notre Dame to receive this prestigious award. The Churchill Scholarship will cover the majority of her expenses at Cambridge, including tuition and fees, a living allowance, and transportation to and from the United Kingdom. 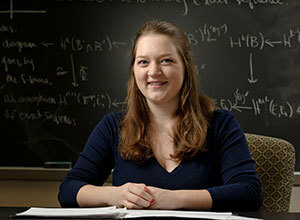 "Undergraduates of Notre Dame's Honors Mathematics Program have an exemplary record of winning national fellowships," said Frank Connolly, professor of mathematics and director of SUMR. "Since 1990, they have won 44 national fellowships or scholarships pursuant to graduate work in the mathematical sciences."